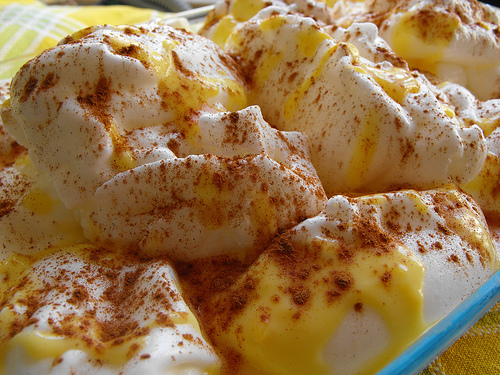 Farofias are Portuguese poached meringues, a very traditional dessert and one of the more unique creations in Portuguese dessert making. This is a smooth, light, and creamy dessert that is perfect for enjoying during the Christmas season when guests are around. They have a distinct lemon flavor and are dusted with cinnamon powder. 1) In a saucepan on medium to low heat, pour in 3 cups of the milk and the lemon rinds until it begins boiling. 2) Immediately remove from the heat and let it cool for 5 minutes. Strain the milk and return it to the pan. 3) Now beat the egg whites to soft peaks, then add 1/2 cup of the sugar, 1 tablespoon at a time, beating all the while. Continue until stiff glossy peaks form. 4) Return the milk to low heat and when steam rises from the surface, drop the meringue in by rounded tablespoons. 5) Poach the meringues for about 2 minutes in the milk, then turn and poach the other side for 2 minutes. With a spoon, transfer them to a large plate to set aside. 6) As soon as all meringues are poached, strain the milk into a large saucepan and mix in the remaining sugar. 7) Add the remaining half cup of milk to the cornstarch in a bowl. 8) Add a tablespoon of the hot milk into this mixture, then add it to the pan and cook, stirring constantly, over medium to low heat for about 3 minutes or until slightly thickened. 9) Beat the egg yolks lightly, whisk in a little of the sauce, stir back into pan and cook, stirring constantly, over low heat for 2 to 3 minutes. 10) Pour the custard into a large bowl and let it cool for about 10 minutes, then float the meringues on top. 11) Sprinkle with the cinnamon and serve. You may want to update “1 lemons rinds” to Zest of 1 lemon. Done. Thanks for the clarification Bryon. Thanks for the recipe, I watched and helped my mother many times with this, but needed a refresher on the quantities. As far as the lemon “rind” or “zest” I have always used the rind myself. I just find it easy to scoop out when I’m done and I don’t need to strain. I’m just careful not to cut into the white fleshy part of the lemon, it makes the whole thing bitter and the milk curdle. I do however have a problem with the quantities. I find that I always need to double the amounts. 1 for me (alone) and the other for guests … (if they are fast 🙂 ) Thanks again… really enjoying passing this down to my daughter now too.